The Happy Hallowishes Dessert Party that is held during Mickey’s Not So Scary Halloween Party is now available for booking. Enjoy halloween themed treats while you toast with a glass fo sparkling cider (no alcohol). Desserts will include chocolate-dipped strawberries, chocolate mousse, cupcakes, ice cream, seasonal fruits, cheeses and other ghoulish goodies created daily by our master pastry chef. Specialty drinks, signature lemonades, coffee, tea and hot chocolate will also be served. Guests can check-in at the Will Call window, located outside the main entrance to Magic Kingdom Park, between 4:00 PM and 7:00 PM to enjoy dinner before the festivities. Guests may also check-in directly at Tomorrowland Terrace Restaurant at 9:30 PM. All Guests will receive identification credentials upon check-in and must present for entry to the dessert party. This premium package is only offered on select dates during Mickey’s Not-So-Scary Halloween Party. Advanced reservations are highly recommended. Valid admission ticket for Mickey’s Not-So-Scary Halloween Party is required and not included in the price of this package..
Pre-assigned seating is available at the dessert party—every table has great views of Cinderella Castle. In the event of inclement weather, the fireworks may be delayed or canceled. However, the dessert party will occur regardless of weather conditions. Call (407) 939-3463 for reservations or book online—Guests under 18 years of age must have parent or guardian permission to call. Previous PostHoliday Wishes Dessert Party now open for reservationsNext Post2018 Walt Disney World Travel Packages to be released very soon! We are going on the 31st… has anyone gone and done the parade viewing this year? I know I posted a month ago about speaking to someone who said it was, but today when I called to make a change, I just checked on it to confirm and the lady put me on hold, said she checked with two other people, including her boss and it will not be included. I haven’t been yet, we are going the end of October, but I did want to give an update. Disney seems to be saying two different things depending on who you get. 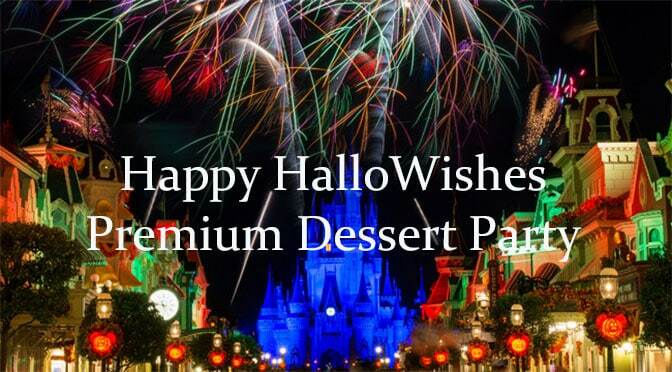 Was VIP parade viewing included in the Halloween dessert party, please? Any update on parade viewing? Isn’t the first one soon? I called Disney to check after I saw the post about calling. The lady I spoke with said that when you buy the dessert party, it says to check in when you arrive. When you do this, you will be given a special pass for the viewing for the parade. The lady I spoke with said it would be the same area as it is for the regular parade by the flagpole. It is not being advertised, but is going to happen as long as you check in she said. I have read somewhere that they called and confirmed there is parade viewing this year. If it is added later, would it be something additional to book (like the pixar music/fantasmic package at HS) or something that would just automatically be added if you had a reservation? Do we know why they aren’t offering the parade viewing this year with this dessert party? I was really hoping that it was going to be part of the package! August. Starting AUGUST, you guys. Hummm assigned tables and no parade viewing.